It isn't that Pakistan didn't try. Days before India moved the International Court of Justice, Islamabad had submitted a fresh declaration that narrowed the world court's jurisdiction. One of the things that the new declaration did was to limit the court's powers to rule on cases that impinge on its national security. The change was aimed at blocking the top court of the United Nations from ruling against the execution of its citizen, Kulbhushan Jadhav sentenced to death by a Pakistan military court. It was meant to be the masterstroke it wasn't. Till minutes before the verdict, Pakistan's Foreign Office spoke about this change. As Thursday's verdict of the court in the Dutch city of The Hague shows, Islamabad was clearly outmaneuvered by New Delhi which filed its case under a different provision, the Vienna Convention on Consular Relations that requires countries to give access to their nationals arrested abroad by law enforcement bodies. This ensured that Pakistani attempt to squeeze India's options at the world court did not succeed. In the words of Judge Ronny Abraham, the ICJ president, "it becomes irrelevant (for the court) to consider the objections to other possible basis of jurisdiction. Therefore, any reservation (or exceptions made) in the declaration by the parties cannot impede the court's jurisdiction". The court accepted Indian request to order Pakistan to hold off the execution of Indian national, who New Delhi insists, was kidnapped from Iran where he was on a business trip and arrested in Pakistan on 3 March 2016. Tackling Pakistan's other objections to its application to keep Mr Jadhav away from the death row was relatively easier. India had already placed Pakistan's letter linking assistance in the probe by Indian agencies to a decision on consular access as irrefutable evidence of Islamabad's stance. It didn't help that Pakistan had refused to grant consular access on grounds that the former naval officer was accused of espionage, sabotage and terrorism. In the unanimous verdict that read out on behalf of the 11-judge bench, Judge Abraham noted that the court could not, on the face of it, find any "express provisions" in the Vienna convention that excluded persons suspected of espionage and terrorism. 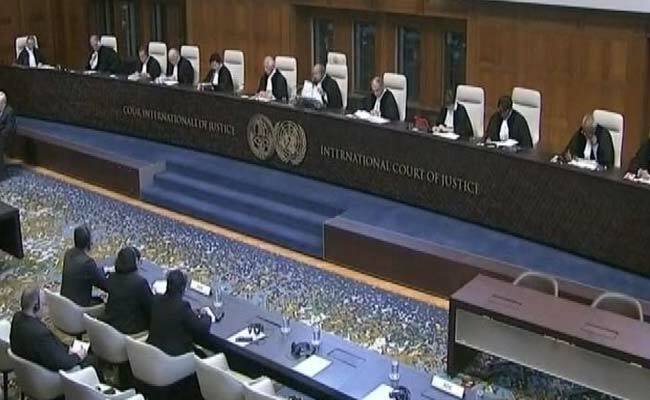 Since Pakistan did not commit not to execute Mr Jadhav till the international court completes its hearing, the UN court also found merit that there was a risk that Islamabad could carry out the sentence "at any moment" after August.